Our Hall Board provides a serial connection to hall fixtures. It turns Hall Buttons plus Lamps, Hall Arrival Lanterns, Fire Service Switches plus Lamps, Top plus Bottom Access Switches, and Medical Service Switches plus Lamps into networked devices. 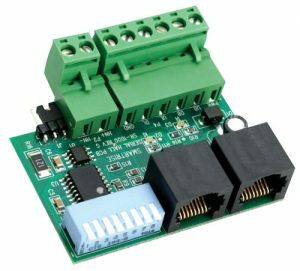 All hall boards connect to the machine room via a shared cat-5 network or shared 4 discrete wires. Network provides communication plus power for boards and devices. Call buttons and other devices are wired locally to a hall board at the floor. Cat-5 connection plug-ins between hall boards to ease installation.